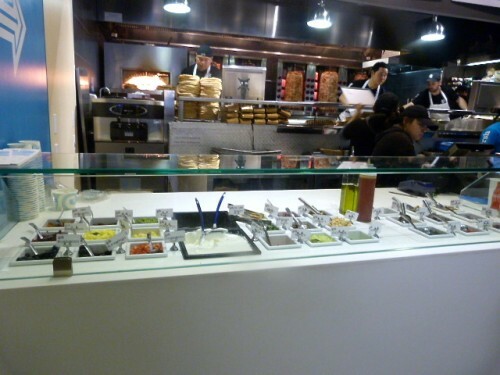 Posted by Andrea H at 10:00 am, December 11th, 2013 under Financial District, Greek, GRK Restaurant, Sandwiches. With warmer weather on the way, it’s time to look past hefty plates of rice and meat to lunches that won’t instantly put you in a food coma and aren’t a salad. I’ve been meaning to check out the yogurt bar at GRK after loving the meats I’ve tried there. You can get not only frozen Greek yogurt, but fresh flown in from the mother country, with a host of sweet and savory toppings at your disposal. For the same price as a plate of street meat you can get fancy yogurt for lunch, but should you? Posted by Andrea H at 11:30 am, April 10th, 2013 under Financial District, Greek, GRK Restaurant, Vegetarian. Is it just me or did Thanksgiving sneak up on anyone else? 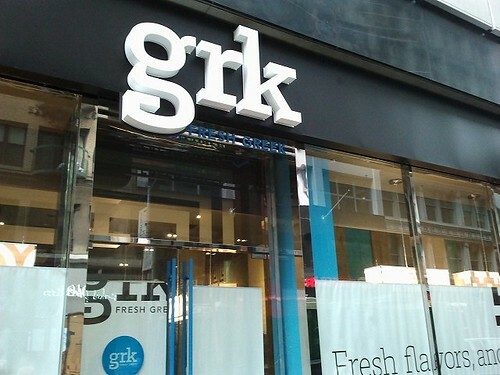 I saw on Twitter that GRK on Fulton St. (btw. Nassau & William) was serving turkey gyro with cranberry tzatziki as a pre-Thanksgiving special and then I realized the holiday is next week. On my first day back to work in the Financial District since hurricane Sandy mucked things up, I headed over to see what happens when you put turkey on a rotating spit and pair it with cranberry-spiked Greek yogurt. (It turns out that magical, crispy things happen). Posted by Andrea H at 12:00 pm, November 15th, 2012 under American, Financial District, Greek, GRK Restaurant. My normal way of approaching opening day at any fast food-type lunch spot is to make sure I have my phone with me for entertainment while standing in a long line, and to decide ahead of time what I’ll be ordering. I had both of these strategies in play on Wednesday when I headed over to GRK on Fulton St. (btw. William & Nassau), the latest spot for Greek fast food in the Financial District. We already have Pita Press and the Souvlaki GR Truck at our disposal, so what could GRK add to the mix? Delicious pork cooked on a spit, that’s what. Posted by Andrea H at 9:30 am, September 13th, 2012 under Financial District, Greek, GRK Restaurant. 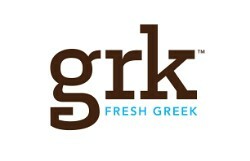 After a couple of delays the Greek restaurant GRK is opening today at 11 a.m. on Fulton St. (btw. William & Nassau). We’ve already walked you through the menu, but you can expect yeeros (aka various meats cooked on spits) and fresh and frozen Greek yogurt with sweet and savory topping options. Some of the prices top the $10 mark, but we’ll be on hand to try the food and give you a rundown tomorrow. Early adopters, leave us your thoughts in the comments. Posted by Andrea H at 9:00 am, September 12th, 2012 under Greek, GRK Restaurant, Openings. 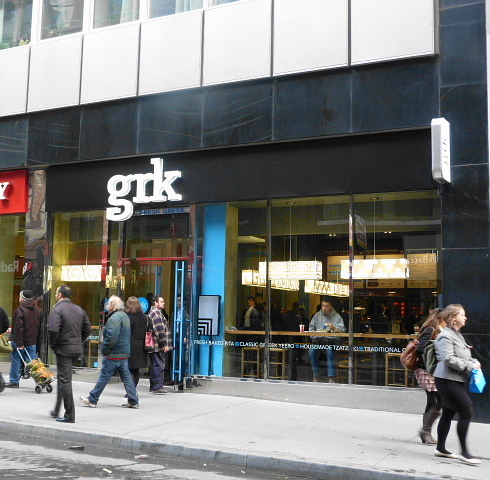 Word was that new chainy-looking Greek restaurant GRK on Fulton St. (btw. William & Dutch) would open on Sept. 6 (or so said the NY Times), but they announced on Twitter that the date was delayed as so often happens with new eateries. Yesterday we got word that they’re actually opening for lunch on Monday UPDATE: We just heard that the opening has been delayed to Wednesday at 11 a.m. A look at the menu shows a few similarities to nearby Pita Press, but less in the way of vegetarian options unless you want a salad. This is a place for carnivores and lovers of Greek yogurt. 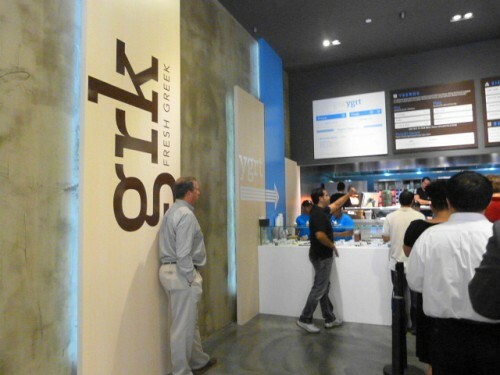 Posted by Andrea H at 9:00 am, September 7th, 2012 under Financial District, Greek, GRK Restaurant, Openings. 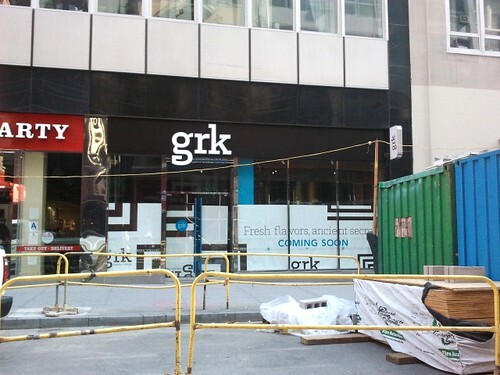 There’s no actual menu up for the chain-y looking grk coming to Fulton St. (btw. Dutch & William), but the items mentioned at the bottom of the window make it seem like it will be similar to Pita Press on Cedar St. Among the dishes on tap will be gyros (which they spell yeeros), Greek yogurt, tzatziki, Greek salad and “freshly baked pita bread.” So nothing totally outside the box, but a decent option if you’re not in the mood for Crisp, Hale & Hearty or Chipotle that are all located on the same block. Posted by Andrea H at 9:30 am, August 23rd, 2012 under Greek, GRK Restaurant, Openings.